When faced with self-doubts, this author chose to take them head on by reinventing herself. You learn from every moment you live, your yearning for betterment takes you a few steps ahead in your life. And you grow a little more as an individual with each positive thought in your mind. You find your way when you genuinely look for it. This is what I learnt from my small journey of #90daystonewyear challenge I took in 2018 when I did my best to work on some self-assigned targets. There were challenges and the biggest challenge was to not give in to excuses. I am really glad that I managed to maintain the discipline on most of the days. Some were very hard when I couldn’t complete the tasks I had planned but even that taught me to manage time better and inspired me to do even better the following day. I was finding myself very chaotic in everything I was doing. One day while returning from one of my classes, I saw a cat basking in the sun and thought how relaxed it looked and then came the thought: Why can’t I simply be calm all the time? What is the reason? I was thoughtful throughout the week and came up with excuses of not having enough time, a multitude of responsibilities, being a mom, a wife and so on, and on. But somewhere in my heart I knew I was just not being honest with myself. I took a day off from everything I was doing and sat with myself. Sitting in a coffee shop, where I spent half the day, figuring out what was going so wrong and wrote down the issues I was facing. After a lot of struggle, keeping all biases aside, I created a systematic ‘to do list’ and ‘not to do list’ for myself. Now I knew what the problem was: time management, and prioritising what’s important and what’s not. Accepting the fact that I can’t get away from responsibilities, I chose to do my best in the given conditions. I made the list but now the question was how to implement it. How do I overcome my self-created issues/excuses? I saw the calendar and it was three months (90 days) remaining to enter to 2019 and I decided to take it up as a challenge; #90daystonewyear and I started. I wanted to work on my weaknesses and so I made them my main focus; I chose to work on my time management skills, putting myself in the centre of everything I do as I wasn’t prioritising myself for many lame reasons. – Regular yoga asana practice without any excuse. – Daily squats, planks and handstand practise. – Eat clean, green and colourful (rainbow veggies) and healthy fats. – Get up when alarm goes off. – Meditate daily (preferably in the morning). – Read for half an hour every day. – Journal everyday (for better understanding and clarity). – Cut down on screen time before bed. – Recreational activities: Get back to craft work I love doing. I’m happy to report that it was a beautiful journey throughout. I gave myself daily targets for 90 days regularly depending on my schedule that day. The night before I would write down my tasks and tick mark all I could complete before sleeping at night. There were really tough days when I couldn’t complete my targets due to various genuine reasons. Some days I got bored and had to drag myself to do the tasks. Reintroduced to a lost self: The journey brought clarity about myself. Rather than pushing myself to finish a task, I accepted my pace and situations and worked accordingly. Each time I tried pushing a little more but never went insane about completing the given task. Trust, I really enjoyed being the way I am; being more respectful of myself. Gratitude journal: Beside a daily journal, I maintained a gratitude journal, which I am writing regularly even now. I had started writing a gratitude diary in the past too but failed keeping the discipline but during this challenge I wrote of all my blessings I received on a daily basis. It kept me very strong throughout the challenge as it reminded me of the positives I have in my life. I realised how focusing on positives make you even more positive. In the same situation, your focus shifts to the brighter side; a big shift in the perspective. Reading: I resumed reading—another big step for me. I had stopped reading since my daughter was born, so I put reading on top of my priority list, pledging to read daily for 20 minutes. It was easier to read two to three pages daily. I know it’s not as pleasurable as the luxury of reading a thick novel at one go, lying on a cosy couch but it still makes you feel great about yourself. Even when really busy, you are able to squeeze that time for something that you really find pleasure in. I am calmer, happier and more organised in life. My productivity has increased manifold. I am able to accept the issues I have within me and working to get better at them. Meditation and pranayama greatly helped me with bring clarity to my mind and peace to my heart. I am regularly practising yoga asanas and doing my strength straining on alternate days. Eating clean and a big cut-down in my sugar intake. I am regularly doing dhyana (meditation) daily. Reading for half an hour every day. Big cut down on screen time. A certified yoga instructor from the prestigious The Yoga Institute, Mumbai, Sheetal is what yogis calls a true yoga convert. Post a degree in mass communication and midway through a budding career in journalism, she realised that her true calling lies in the journey inwards that leads towards enlightenment and eternal bliss. Specialised in teaching the practical and theoretical aspects of yoga, she loves to combine creative sequencing, a spirit of playfulness and a dose of inspiration to help you deepen your practice. She seeks to help others thrive in life by nurturing body, mind and soul with yoga, and hopes that you step off the mat feeling refreshed, nourished and balanced. By incorporating asanas, kriyas, mudras and bhawas in her classes she helps students achieve strength, flexibility and inner peace. 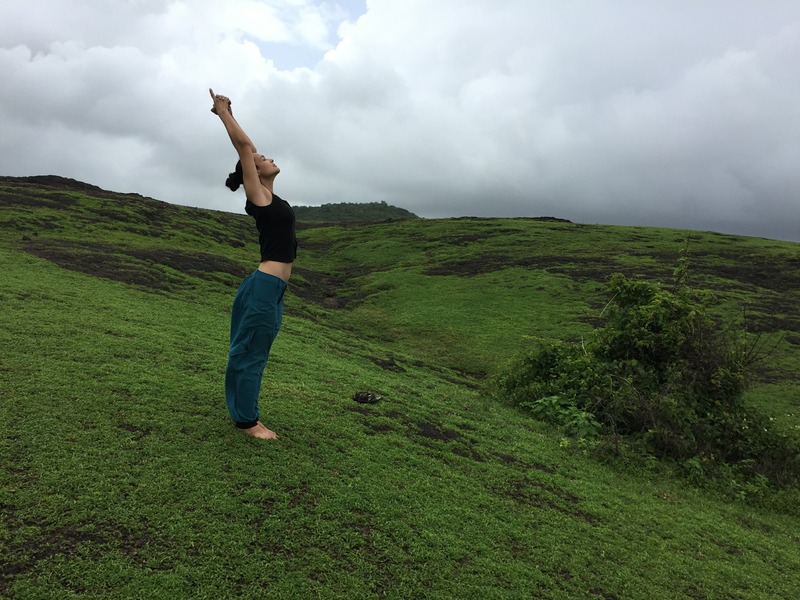 Sheetal teaches Yoga Classes in the Bandra and Khar areas of Mumbai, India. She also organises and conducts corporate yoga workshops. Her classes focus on alignment, breathing, awareness and mindfulness. She believes in the healing power of one's own body and is also a strong advocate of natural living and organic foods. Sheetal completed her 900 hour Ashtanga yoga TTC from The Yoga Institute, Mumbai and 200 hour RYT Ashtanga Vinyasa Yoga training with Ashtanga Vinyasa Yoga, Mysore. Her aim? Reconnect with yourself and experience the bliss within.